Q. Do I need to feed the plants? A. You do not need to feed the plant cuttings, however if you would like to see faster growth you can use a very small amount of houseplant food. Remember to use a very small amount. Q. Do I have to plant the plant cutting after it has rooted? A. You do not have to plant the cutting. Once it has roots you can simply cut some of those roots off each year. You just don’t want the plant to get root bound. A. Most orders ship within 2 days. If you need it by a certain date just let us know either by e-mail or phone. Q. Where do I get my plant cuttings? A. Just about home center, or garden center, or even your back yard. If your really in a bind contact me and I’ll send you some. Q. If I don’t see what I’m looking for can I still order it? A. Most likely, just give me a call or send me an email and I will get back to you. Q. When will you be doing a show in my area again? A. Just send me an email with your town and I will tell you when I will be back. Q. Where do I hang my Hanging Water Garden, plant rooter? A. Just about anywhere. 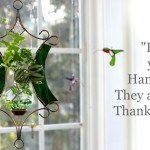 Most people hang them from their curtain rod in a window. The kitchen window is a popular spot. Q. Do the plants need a lot of sunlight? A. No, ivy is a medium to low light plant and even grows well in artificial light. Q. How often do I have to change the water? A. It takes months before the water will need to be changed. You will only have to add water every so often. Q. How do I clean the vase? A. It is very easy to clean. The vase comes off of the copper frame for easy cleaning with either a dishcloth with soapy water or a bottlebrush. Q. Do I need to clean the copper frame? A. The copper frame does not need to be cleaned; it has been dipped in a clear poly finish and will last for years. Just dust. Q. Is there any special water I need to use? A. I like to use Spring Water. If you have good well water go ahead and use it. Do not use softened water, or filtered water, or distilled water. Remember the plants are living on the trace minerals and nutrients found in the good water.